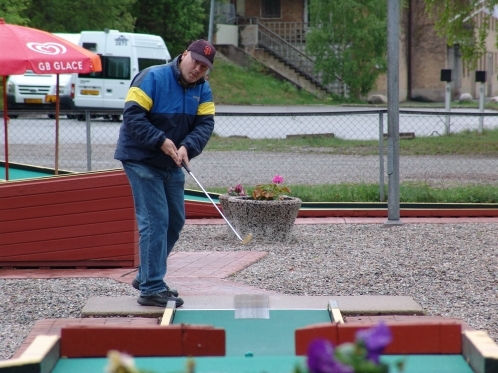 This weekend was the start of the Swedish Elitserien and the all-meets-all in match play weekend was played on felt in S�dert�lje. The weather was chilly with occasionally some showers. This is the same lanes where the YEC was played in 2007. The courses are quite easy with lots of aces to be found if you play well. The course record before this weekend and also the World record were made by Tim Hansson on the YEC in 2007 and are 22 strokes. Would that possibly be beaten this weekend? As usual Uppsala was big favorites especially since they now again have Fredrik Persson in the team, but also because the first round was played at felt. Supposed challengers would be home team from S�dert�lje and maybe also the Skoghall team which had a really sharp line-up on paper. J�nk�ping and Sj�viken was both on paper a bit weaker than last year and Tantog�rden don�t have the felt surface as their best part. The two new combers Mj�lby and Gullbergsbro were expected to make more occasionally trouble for the other teams. S�dert�lje and Uppsala meet already in the first match on Saturday and that was to be the best game of the weekend. This was the only match of the weekend where both teams had a blue team average. The routined team from Uppsala won this match with a brilliant 142 result, which later proved to be their best result of the weekend. After this initial loss the home team from S�dert�lje won a tight 3-stroke win match against last year�s bronze medalist Sj�viken. But after that match no other team came really close to beat S�dert�lje and in the end they had a strong 12 out of 14 points. They showed some really sharp results like the overall best 136 team result where all players in the team had blue scores. But was it to be enough for the lead? Last year�s silver medalist the Skoghall team from Karlstad, V�rmland lined up a really strong team for this weekend. The experts had said before this year�s Elitserie that if any team could beat Uppsala for the title it would be Skoghall, but it all depended on the lineups and especially that they wouldn�t be behind after the felt-weekend. A few weeks before the team manager said to the Swedish magazine "Bangolf" that he was not at all sure of the lineups with only 3 names clear. But all the stars turned up and the team consisted of Filip Svensson, Jesper Andersson, Lars Kvael, Stefan Bj�rk, Dino Medenhodzic and Ulf Kristiansson. The inspired team only lost to the home team S�dert�lje in match 5 before meeting Uppsala in the final game. Uppsala had all their best players available and was after the initial victory over the home team even more favorites. But in the fourth game on Saturday something very unusual happened. Carl-Johan Ryner that had played exceptionally felt-game as usual all the sudden appeared as a more average player. After the series of 25-28-29 he all of a sudden made a 39. And the opponents from the south Sj�viken was not late to thank for the surprising opportunity. With a strong 150 round they beat Uppsala with 7 strokes making the league very much more interesting. But two victories later Uppsala had the opportunity to after all be in the lead if they beat the Skoghall Team. This was the last game of the weekend and it was to be a real thriller. In the beginning the Skoghall Team played astonishing golf. This weekends dominant player Filip Svensson opened up his round with 8 straight aces. And the whole team of Skoghall had an average of 1,4 strokes per lane after 34 played lanes. Even though they where only in the lead over Uppsala with 5 strokes. But the tricky part of the course in S�dert�lje is the last 6 holes. And slowly Uppsala came closer and closer and with only 6 lanes left to play they where in the lead. But lane 18 in S�dert�lje is not for anyone with shaking nerves. Uppsalas five players used a lot of strokes on this the last Vertical hole without green lane, P�lder (2), Persson (1), Olsson (3), Brown (4) and Ryner (2). And Skoghall also showed some nerves with Andersson (1), Medenhodzic (3), Kristiansson (3), Svensson (2) and Kvael (3). So after a tied 12-12 on lane 18 the match also ended with a tie. Worth noticing is that both the closers Kvael and Ryner had the opportunity to ace for victory. Kvael started and made a 3 and after that Ryner made a 2 ending up in a tie. So the table shows a surpricing leader in the home team of S�dert�lje with 12 points. Uppsala is second with 11 points and Skoghall is third also with 11. The Sj�viken victory against Uppsala makes them hanging on for the medals with 10 points. Then the table is making a huge jump down to the last 4 teams. They all lost against the top teams and they were beating each other to make a situation where Mj�lby and Tantog�rden have 4 and J�nk�ping and Gullbergsbro have 2 points. The weekend must be considered a big disappointment for Tantog�rden but maybe especially for J�nk�ping. Individually best by far was Filif Svensson with the amazing series of 26-24-28-26-29-31-24 giving him an average of 26,9 and a margin to the second best player Daniel �gren of S�dert�lje of remarkable 12 strokes in 7 rounds. Filips game this weekend is probably one of the best ever individual performances in the history of Elitserien. The current world record and course record of 22 strokes was (inofficially since records can only be set in WMF/EMF tournaments) equalized in the last round by Mj�lbys felt expert Anders G�rlin. Next round is played the 18-19 of June on eternit in J�nk�ping. May the home team then already now plan for a terrible revenge? Wouldn't really say it's a big suprice that S�dert�lje are in the top. They have the round at their homecourse and they played really well! So atleast I'm not suprised! Very good played guys! !